Watereless manicures and pedicures! Safe- Nails!!! It may sound strange to you to hear me say “waterless pedicure”! How can you have a pedicure without soaking your feet? How do you remove the non living tissue from the nail plate? That can’t be sanitary can it? Well, yes you can and yes it is! Safe T Nails is a complete package that allows you to give (or get) either a manicure or pedicure without the use of water. One time use, with the implements to file your nails, push your cuticle back and moisturize your hands or feet. 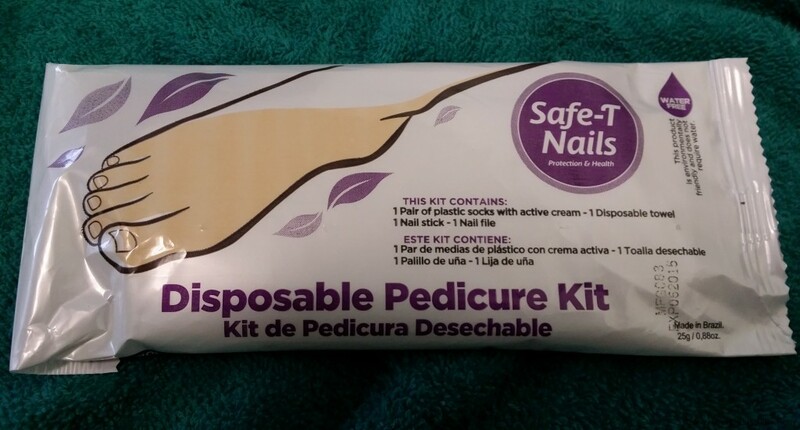 The Safe-T Nails Pedicure Kit is an exclusive line of waterless pedicure kits that are 100% disposable, imported from Brazil, and used by Safe-T Nails customers worldwide. The package as you receive it. Unwrap your goods. 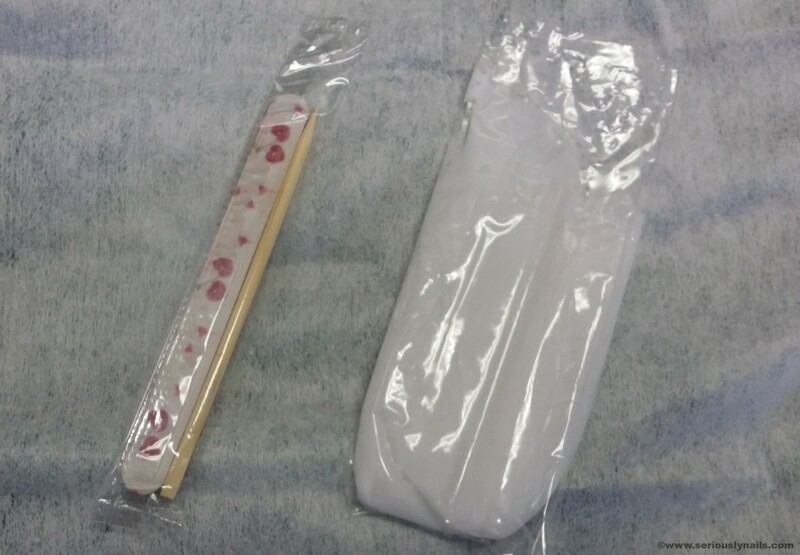 There is a file and a wooden pusher and a little baggy with two “booties” filled with Safe T Nails exclusive Active Cream. The Active Cream is antiseptic, anti-fungual and anti-inflammatory. All of these items are one time, disposable items. Put on your little booties and hang out for about three minutes. 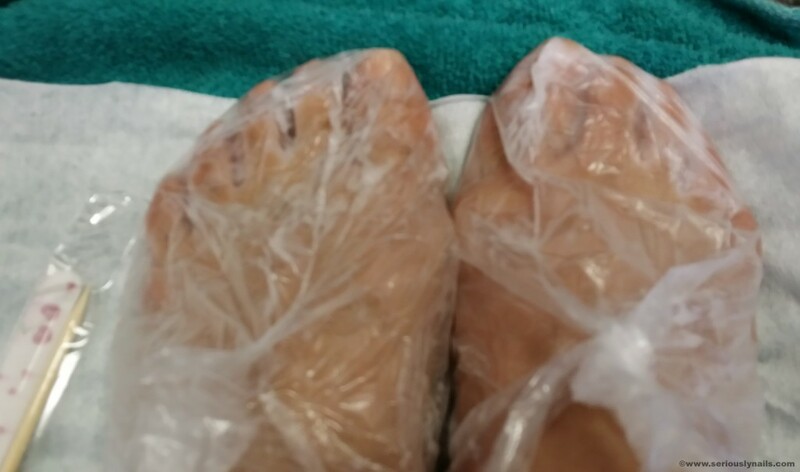 Use the wooden pusher to split open the baggie to reveal your toes. Using the wooden pusher, gently push back around the cuticle area. This is quite easy as the Active Cream loosens the non living tissue very well. Using the enclosed towel, wipe away the remaining Active Cream and this is the final result. I didn’t do any nipping of loose non living tissue so you could see the end result before complete beautification. Here’s where I would place Safe T Nails. I would sell them in my salon. For people that are travelling and want to take care of their finger and toe nails while away. Or, if I had a small space where I didn’t have access to water, I would happily use these. Here is a video from their website.